30kW solar power systems are becoming an increasingly worthwhile and attractive investment for small to medium businesses across Australia, with payback periods in the 3-5 year range in most parts of the country. This article provides an overview of the ranges of prices, energy yields (in kWh), and financial returns that a business may expect to see from a typical 30kW solar PV system. How much does a 30kW solar system cost? According to data from Solar Choice’s installer network database, a fully installed 30kW system will cost roughly $30,000 – $40,000 as of February 2019. These figures include the up-front ‘discount’/incentive available under the federal government’s Renewable Energy Target for systems under 100kW in output capacity, as well as GST. With prices in this range, clean & affordable energy is well within the reach of SMEs facing increasing pressure from rising grid electricity prices. The table below provides a rough indication of the amount of energy that a 30kW solar system will produce per day (averaged over the year) in Australia’s capital cities. Keep in mind that the figures in this table are annual averages – daily output figures will generally be higher in the summer and lower in the winter due to the difference in the length of days. In the winter, a system may generate 20-40% less energy, while in the summer it may generate 20-40% more. Is 30kW the right solar system size for your business? Roof space available: A 30kW system will require at least roughly 150-200m2 of area, but possibly more depending on the wattage of the panels and whether the they require tilt frames. Your energy consumption habits: In many places in Australia, solar feed-in credits are not paid out for energy sent into the grid by solar systems over 10kW in capacity; this means that any solar energy that your system produces that you cannot use directly is of no financial benefit to you. It is therefore important to ensure that the system you ultimately select is sized to meet your business’ energy consumption levels and habits. Your budget: If you have enough roof space to install the maximum recommended solar system size, then it comes down to whether you have the budget to invest in a system. What is the typical ROI and payback period for a 30kW solar system? 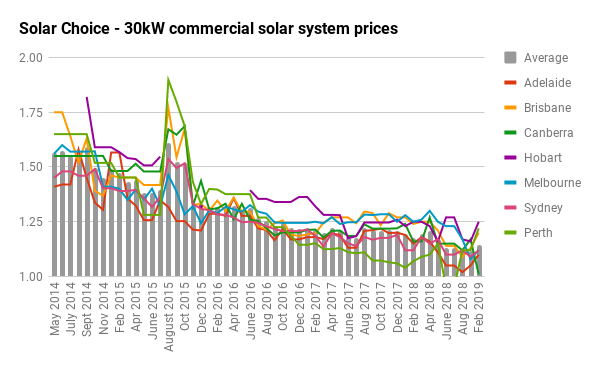 According to our own data from nearly 300 business cases compiled in 2018, payback periods for appropriately sized commercial-scale solar systems in Australia are around 4 years on average, with internal rates of return (IRR – similar to ROI but more sophisticated) easily hitting 20-30% in every state & territory in the country. Solar Choice runs tenders for commercial projects across Australia. We can help you compare prices and choose the right system size. You can request a no-obligation Business Case Analysis below. I am not sure where they get the figure of 3 Peak Solar Hours per day on average from as the Commonwealth Government puts out stats on this that the BOM have provided and constantly re analyse – the Commonwealth figure for average solar sun hours per day in Sydney is 5.1. An examination of the stats provided by manufacturers also indicates there are only split hairs in the so called “premium” brands and the rest. In many cases there is no difference and it is only perception and marketing that provides this illusion to the general public. All this really does do is allow companies to optimise profit. As long as the warranty CAN be honoured and that the company manufacturing and supplying the warranty is sound is perhaps the main thing. I think there is potentially a difference between the Peak Solar Hours mentioned and the average daily sunshine we normally use when talking about the expected generation of solar PV systems. With regard to Premium products and manufacturers versus less premium products, although it may not seem a lot on the surface an extra 2% will add up to a huge saving over the lifetime of the system and as energy prices continue to rise this 2% extra will bring greater rewards. Premium companies who take the time to give people and extra 2% will also be putting out panels that have passed durability tests that far exceed the minimum standards, some even offer a 25 warranty which includes minimum performance standards over the lifetime of the panel. These Premium installers also have a genuine concern that when the poor quality cheap solar PV systems fail their will be a backlash against the industry, we would also prefer that everyone has a positive experience with solar. Solar Choice exists to ensure that residential and commercial customers are getting the best deal with their solar PV systems and working with installers and manufacturers who are more likely to go the distrance than those offering cheap solar deals.